By popular demand! 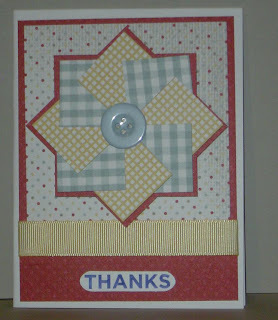 After seeing this card by our featured cardmaker, Denise, so many of you asked for a tutorial, we just had to bring you one! I've seen three different techniques called a "Pinwheel" card. We had a previous tutorial on one of them here. Several places I looked called today's technique a "Faux Pinwheel," but I'm just calling it "Pinwheel II." 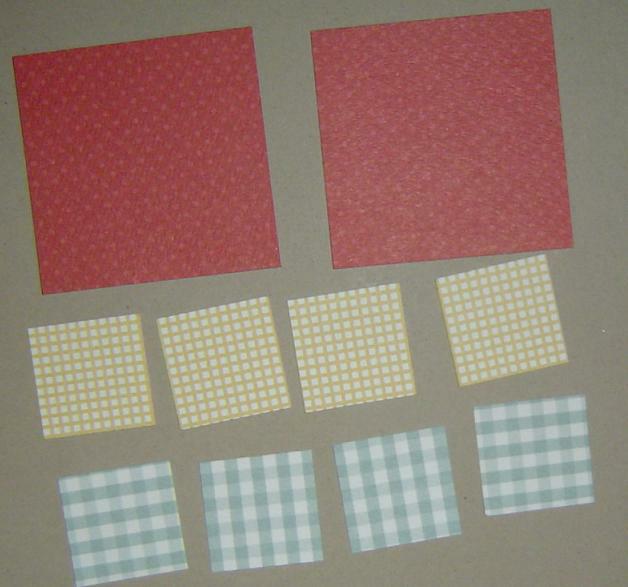 Start with two squares measuring 2-5/8" and eight squares (four each of two contrasting papers) measuring 1-1/4". Adhere the two large squares to each other at right angles to make the base for the pinwheel. If you have a hard time getting them straight, try using a piece of graph paper as a guide. Alternate the smaller squares and adhere them to each corner of the base. NOTE: On the first square, only adhere the right side of the paper to the base. When you get to the last square, you will have to raise up the left side of that square to slip the last one under it. Place a brad or a button in the center for embellishment. Card base - A2 - 4-1/4 x 5-1/2"
Background layer - 4 x 5-1/4"
Here's a great video tutorial I found on youtube. She goes a step further and even makes her pinwheel spin! Thanks to all of you who requested this week's tutorial topic. If you have suggestions for a tutorial, or would like to share one of your own, please write me at kate@operationwritehome.org. These would be great for using up some scraps. Thanks so much for this tutorial. There are a few quilters in one of my cardmaker groups and I thought that "quilted card" would be a fun way to use some scraps of DP. These directions are going to come in very handy. I think this card is adorable! I want to make some that actually spin! Thanks for the awesome tutorial, Kate! OMGosh!!! 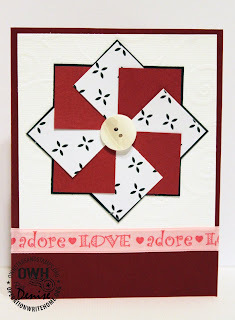 I LOVE, LOVE, LOVE these and SO wanted this tutorial when I saw Denise's cards. I've made one so far, but shippers, stand by for pinwheels!!!!! Thanks Denise and Kate!! Off to make more. I got carried away and made 30-40 of these over the weekend. They're so much fun! Check my blog for pictures. Thanks so much for sharing this, Kate! I was leary to try it when i saw Denise's card because I really didn't understand how to do it (I'm a visual learner and her words just didn't make sense to me!). So, thanks for the visuals - it really DOES look simple! 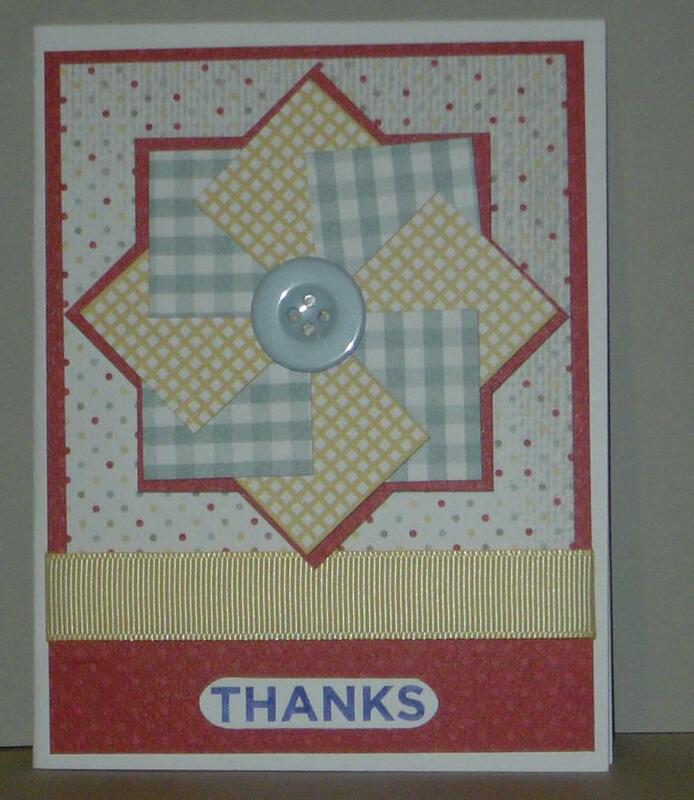 this is so perfect for my scraps that i can't bear to throw away! I love it!! Thanks!!! This is a great way to use 'ugly' or hard to work with patterns, etc. It works like a dream!!! LOL Sandy should make a note of this for the Stump Sandy segment on OWH TV on Ustream. I tried this and it worked! It does look harder than it really is so I made card. Thank You for this tutorial. TANK YOU so much for this tutorial..it's so much easier than it looks! LOL Hopefully I will be able to get back to card making soon! I go to the pain center tomorrow for my back..we will see how that goes! I have posted my tutorial as well. 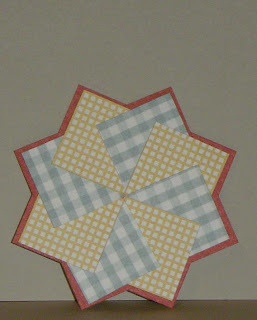 I used the corner scallop punch to make a scalloped pinwheel. I love this pattern! 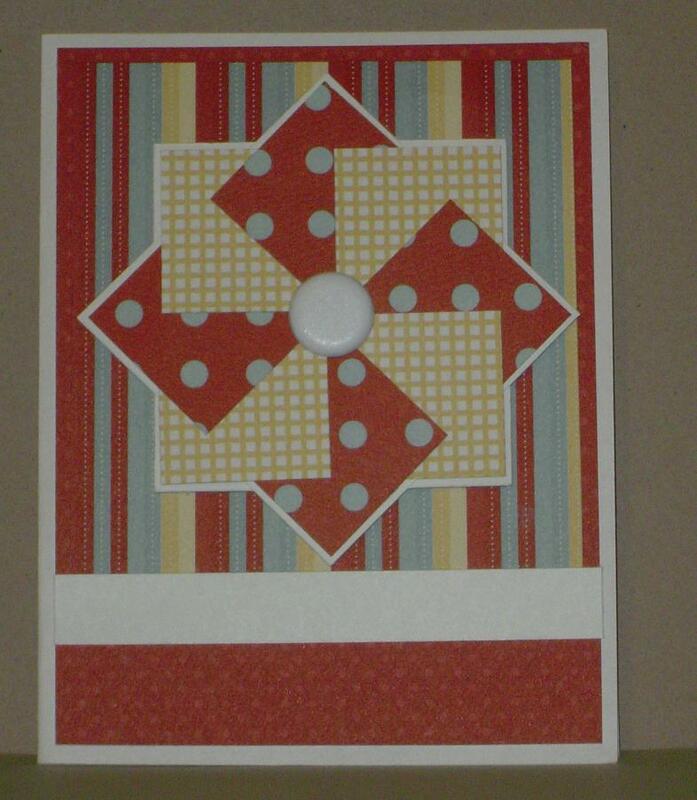 I like how you can piece it together quickly and make a lovely card--and I can use up some of my scraps! Lots of fun to make, too. My 12-year old son wants to make some too! Thanks so much for sharing! HELP - how do I stop making these cards? 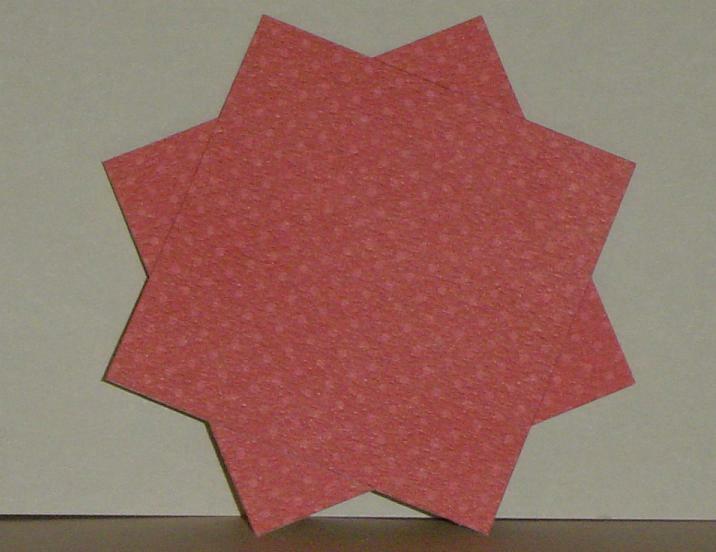 Kris will be surprised when she receives a whole box full of pinwheel cards. I can't stop. Every time I make one - I see some other scrap laying around and I think "Oh, I can use that." Thank you for sharing this tutorial! 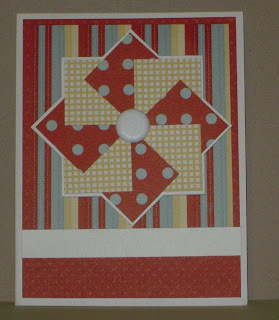 I loved creating this pinwheel with scraps! !